WASHINGTON (AFNS) — The Air Force recently approved two initiatives for the remotely piloted aircraft career field. First, eight RPA reconnaissance squadrons will be redesignated as attack squadrons. Second, Air Force Chief of Staff Gen. Mark A. Welsh III authorized RPA aircrews to log combat time when flying an aircraft within designated hostile airspace, regardless of the aircrew’s physical location. The changes were two of many recommendations that emerged as part of Air Combat Command’s Culture and Process Improvement Program, which seeks to address a number of issues affecting operations and the morale and welfare of Airmen across the RPA enterprise. 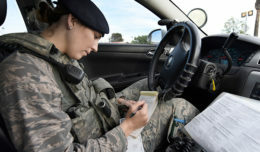 The redesignation will affect the names, but not the core missions of RPA squadrons at Holloman Air Force Base, New Mexico; Whiteman AFB, Missouri; and Creech AFB, Nevada. These units, consisting of approximately 600 officers and 700 enlisted Airmen, will continue to provide real-time intelligence, surveillance and reconnaissance to commanders, close air support to ground troops, and post-operation battle damage assessment to senior leaders. Previously, squadrons consisting of MQ-9 Reaper aircraft were designated attack squadrons, while squadrons of MQ-1 Predator aircraft were designated reconnaissance squadrons. The redesignation anticipates the Air Force’s ongoing transition to an all MQ-9 fleet and acknowledges the capability of these units to support military operations that can include strikes against targets. The cost of the redesignation is minimal, mostly affecting signs, stationary and other local items that display the unit’s name or emblem. Since their first employment over the Balkans, Air Force RPAs have been in high demand, according to Air Force senior leaders. This has led to rapid expansion of both the number of squadrons and the number of operators. Unique organizational structures and names evolved during this time, and the Air Force is now taking steps to standardize operations and improve conditions for operators. The Air Force reduced the number of combat lines to 60, from 65 in 2015. They also increased incentive retention pay for pilots to $25,000, matching incentive pay for rated pilots in other airframes. ACC is expanding the training pipeline for operators, creating a more robust force and decreasing the current operational tempo. A combat operations-to-dwell ratio of 2:1 will provide Airmen predictable schedules, improve work-life balance, enable further professional development, offer increased training opportunities, and ultimately improve readiness, according to Col. Jeffry Long, ACC’s director of CPIP. Chief Master Sgt. of the Air Force James A. Cody engaged with Airmen deployed to Afghanistan in support of the NATO Resolute Support mission and Operation Freedom’s Sentinel from April 4-6 through a series of Q&A format all calls, small group discussions and personal site visits. Cody made stops at Bagram Airfield, Resolute Support Headquarters in Kabul, Hamid Karzai International Airport and Kandahar Airfield, where he was able to see firsthand the impact Airmen are making every day in Afghanistan. Airmen in Afghanistan are accomplishing critical roles as they perform launch and recovery of aircraft for counter-terrorism missions, find and process detailed intelligence information for combatant commanders, or train, advice and assist the Afghan military. During the all calls and discussions, the chief candidly and honestly answered a variety of questions ranging from the new Enlisted Evaluation System to health care and compensation. He also received mission briefings from each of the units involved and had an opportunity to see Airmen display the weapon systems they operate. Throughout his interactions, he reminded Airmen of one thing.